Locus Maps for free?Locus	Locus Maps for free? You bet! Three free Locus Maps for all new Locus Map users. The map choice is up to you, all the World is available. Locus Maps are based on OpenStreetMap data that are rendered directly in Locus Maps application via MapsForge toolbox. The maps cover the whole World and are available in map packets covering individual states which are downloaded solely for offline use. They are smaller in data size than maps downloaded from the online mode and can be switched into several themes: hiking, biking, ski, town plan and road map. Each theme is based on the same map data but displays different layers and symbols according to the user’s needs. Locus Map developers create and adjust the map key and decide which map symbols and layers will be displayed in which map theme and they are active members of the OpenStreetMaps community. They actively participate on the maps creation, the maps are available only in the Locus Store – that’s why Locus Maps. Where can I get Locus Maps? It’s the same as with all other maps provided by the Locus Map app – they are available in the Locus Store. Locus Store can be accessed by tapping Menu > Store (you have to be online), then select the Providers tab. Find Locus Map > Maps and you can browse a wast portfolio of map bundles. When selecting a map from a folder it’s possible to display the map packets on a preview map – it makes clear what areas are covered by which map. How do I find out that the map is for free? The blue button DOWNLOAD contains an icon of a parcel. Tapping it a dialog appears confirming that the map is really free and displaying number of remaining gifts. 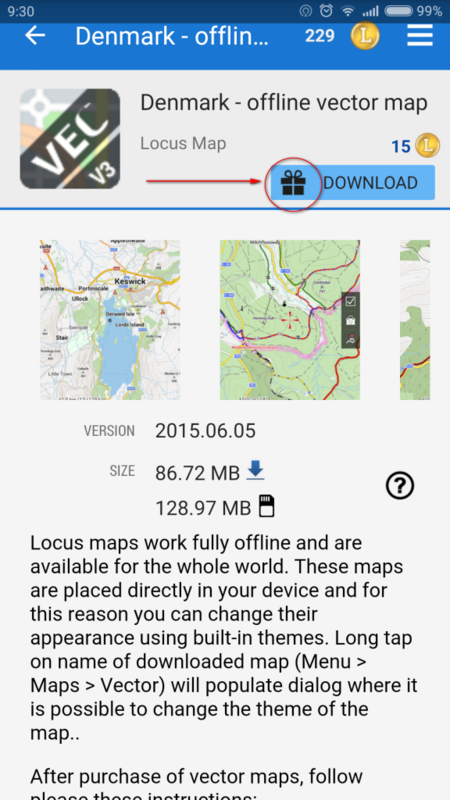 How can I download the Locus Maps to my mobile or tablet? Tap that blue DOWNLOAD button and then FREE in the next dialog. The map starts downloading. In the meantime you can go on working with Locus, the download status is displayed in your system tray. The downloaded map appears in the Offline tab of your Locus Map manager. And now there’s the last point of the process: get outdoors, the weekend’s coming! go to menu > settings > miscellaneous > default directories. How to get that blending notification bar?